Well, he's a bit gruff, gone a lot of the time.... apparently he likes to hunt quite a bit, but she's a lovely homemaker. So far, they've just moved in a few things-- they pack light--but we think they're going to stay a while. Maybe raise some kids. Mr. & Mrs. Sparrow next door must have moved out during the night, because they're no where to be found. Oh well. Lose a neighbor, gain a neighbor. Mr. & Mrs. Kestrel's new home. 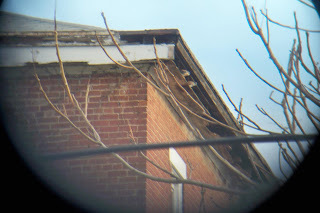 Yes, I was actually able to take a picture with my little digital camera *Through* the bird watching binoculars. I didn't know I could do that. 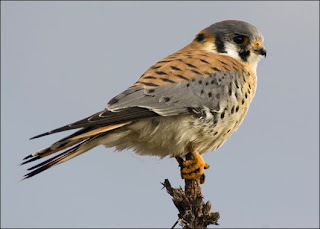 Here's a clearer pic of the American Kestrel, our smallest falcon, found on the web. That's a very old church on what was the highest point in old Covington (prior to the annexation of the vineyards and farm land that became Devou Park and surrounds). 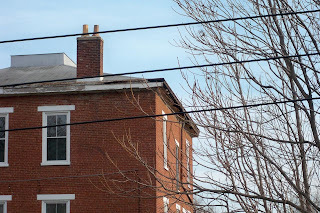 Obviously, it needs some serious box gutter work. Fortunately, it's also perfect for our smallest falcon. I hope they stay and rear young. And eat sparrows and starlings. That's not a bad amount of wild life for just a few months on or over a postage stamp lot in the city. It seems like more than I could have expected a decade or two ago. If I include the whole of Covington, the list is larger and more bizarre (beaver anyone?). In any case, I expect to be able to add some swallows, finches, wrens, maybe owls, wood peckers, and a few more land dwellers by the end of this summer. All in all, I think it's pretty cool. We live in an interesting time for nature lovers. UPDATE: I've seen or heard the Kestrels every day now, and I've also caught them mating more than once (not that I'm a bird-perv). That suggests that they may be here for the season. That has to be a good omen. We called Junkos snowbirds where I grew up in NC. Rock Doves are pigeons? The Kestrels are way cool. I'd love to find some around here. I never knew. I currently have a mother hummerbird who has set up a nest on our backyard patio chandelier. We adore her. OK. Fine! Closet doors are finished! I bought six cans of the stuff, ya know.